This is the SWEETEST sleigh I’ve ever seen! Santa needs some extra sugar to get all the way around the world in one night! This is the perfect sleigh for him. We found it easier to work from the bottom up, starting with the runners. On the bottom of the Kit Kat, lengthwise, put two lines of glue near the edges. With the Candy Cane hooking towards the top of the sleigh, attach the candy canes. Stack the Hershey’s Miniatures on the Kit Kat. We started with a layer of 4, then 3 and so on. 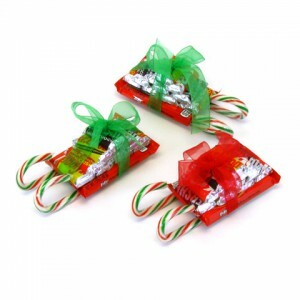 If these sleighs are traveling I suggest using a little glue to help keep them in place. Tie a ribbon around the sleigh to help secure the sleigh even further. Share your sleighs with us on Twitter or Facebook!